Make sure everyone has somewhere to sit. If your garden furniture has spent the winter in the shed or exposed to the elements, give it a good clean. Buy or borrow more if you need it. Indoor furniture can be brought out onto a patio and cushions can turn a low wall into a comfortable seat. For a children’s party, spread a blanket on the lawn for a picnic tea. Don’t spend all your time in the kitchen or roasting over a hot barbecue! Light, simple food is the most appropriate on hot summer days. When deciding on the menu choose dishes that can be served cold or those that can be mostly prepared in advance and cooked quickly just before serving. If you grow your own fruit and vegetablesgive them the starring role. Prevent an accident spoiling the party by inspecting your garden from a stranger’s point of view. You know about that wobbly paving slab and the low tree branch but they might catch out an unwary visitor. If you can’t remove or shield a hazard make it more visible and warn people about it. If your party will go on after dark make sure that paths and steps are adequately lit. Be especially careful if there are going to be young children around and your garden is normally a child-free zone. Check that you haven’t left any gardening tools or other potentially dangerous objects lying about. Lock sheds and other outbuildings. If you have a pond you can’t take even the smallest risk of an unaccompanied toddler wandering too close. If it’s small enough, you might be able to cover the pond. If not, perhaps you can put up a temporary fence or barrier of some kind. In hot weather people can become dehydrated more easily than they realise, and drinking alcohol doesn’t help! Offer iced teas and non-alcoholic cocktails along with the beer and wine for a refreshing change. Sunshine is wonderful – in moderation. On a hot day, unless your garden is naturally shady create cool retreats with parasols, awnings or shade sails. Children can tire quickly in the heat so follow energetic activities with games that can be played while resting in the shade. Flies, wasps and other insects love party food! Don’t bring food outdoors until people are ready to eat, and clear away any leftovers. If you’re having a buffet use mesh covers to protect food. In the evening, light citronella candles or flares to repel gnats and mosquitoes. While you and your guests are having fun be aware that all the chatter and music might not be so pleasant for your neighbours and try to keep the volume down, especially at night. To avoid complaints tell them when you’re planning a party so they know what’s going on. Better still, invite them round so they can enjoy it, too! If you love the idea of outdoor entertaining but your garden isn’t as attractive as you’d like – don’t despair! 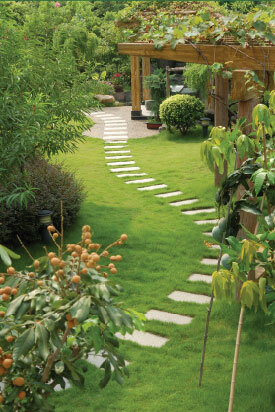 A garden makeover by a professional landscape gardener needn’t cost a fortune. Find one who will give you a free consultation and a no obligation quotation. You might be surprised at how easily your ordinary plot can be transformed into a stunning party venue!